Electronic portal imaging devices (EPIDs) have replaced the conventional radiographic films for the acquisition of portal images in radiotherapy. EPIDs were originally implemented for patient position verification, but their use has been later extended to obtain dosimetric information for pre-treatment field verification and in vivo dosimetry. ,, Applications in this field have been performed to predict portal dose images for portal imaging devices of various types. A practical advantage of EPID-based dosimetric verification is its availability and simplicity of use. There is neither phantom nor additional connection of devices necessary. In literature there are many reports on different type of portal dosimetry systems such as fluoroscopy-based systems, , liquid filled ionization chamber matrices-based , and amorphous silicon (aSi)-based systems. , Over the last few years, aSi detectors have become increasingly popular for online portal imaging, requiring less excess dose to be delivered to the patient portal image and yet yielding a superior quality image than the liquid filled ionization chamber EPID. Munro et al. and Bouius investigated in detail the characteristics of a small (96 Χ 96 mm 2 ) aSi flat panel detector. They measured the linearity, spatial resolution, glare, noise, and signal-to-noise characteristics of an indirect aSi EPID construction, containing a metal plate/phosphor screen generating optical photons that are detected by the photodiodes. Greer and Popescu  investigated the dosimetric properties of an aSi EPID using a continuous frame-averaging acquisition mode and a 6 MV radiation beam. They concluded that the aSi EPID showed promise as an efficient verification tool for IMRT delivery, the main limitations being related to the dead time in the frame acquisition and sensitivity calibration. Van Esch et al. explored the possibility of using a commercially available aSi portal imager for absolute dosimetric verification of the delivery of dynamic IMRT fields. 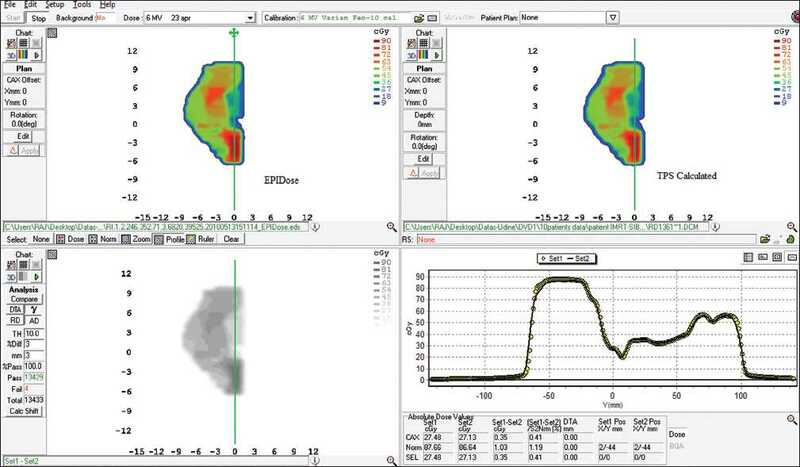 In the present study, we have implemented the newly developed portal dosimetry software using independent dose prediction algorithm (EPIDose TM , Sun Nuclear Corporation, Melbourne, FL) and evaluated this new tool for the pre-treatment QA of whole pelvis with simultaneous integrated boost for step and shoot IMRT (WP-SIB-IMRT) of prostate cases. The software calculates the dose distribution in a phantom from the fluence image acquired by EPID. To validate it as a tool for routine QA, we compared the planar doses of all plans with our routine 2D-diode array detector MapCHECK TM (Sun Nuclear Corporation). The use of new dosimetric tools and procedures for clinical QA practice is becoming increasingly important, especially when taking into account the necessity of reliable but also time-sparing QA protocols. Although each institution has developed its own equipment and modality, most of them use the g index for QA analysis first presented by Low et al. The efficacy of the IMRT technique and the consequently increasing number of treated patients, along with increased planning and delivery experience, assert the necessity of defining reliable pass/fail criteria to facilitate the dose distribution comparison process. The importance of this issue finds its confirmation in several published works, where the interpretation of the g map is addressed as a crucial point. The fluence analysis has now being established an essential tool to evaluate the consistency of two dose maps (measured and calculated). Its efficiency derives from the fact that it conjugates both dose difference (DD) and distance to agreement (DTA) pass/fail criteria for dose distribution comparisons. Hence, in this study, statistics of γ-values were used to quantify the agreement between measured dose distribution and calculated dose distribution in the validation of WP-SIB-IMRT plans. 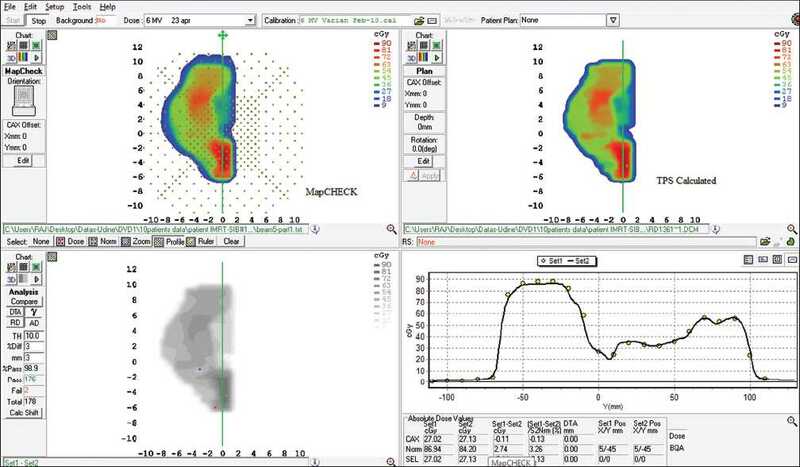 The main objective of the present work is to implement the newly developed portal dosimetry software EPIDose TM and evaluate this new tool for the pre-treatment IMRT plan QA of whole pelvis with simultaneous integrated boost (WP-SIB-IMRT) of prostate cases by comparing with routine 2D array detector system (MapCHECK TM ). All measurements were performed using a 6 MV X-ray beam from a Clinac 600C linear accelerator (Varian Associates, Palo Alto, CA, USA) equipped with Millennium120 multileaf collimator (MLC). MLC contains 120 leaves; it is designed with 5-mm width leaf (central 20 cm of field) and 10-mm width leaf (outer 20 cm of field) projected at isocenter. The maximum over travel across the beam axis is 16 cm, and the maximum distance from a leaf to the carriage is 15 cm. Due to this limitation, for large target volumes (as in the case of Whole Pelvis) it is necessary to split the fields into 2 parts. In this work, we have compared the measured doses between the two detectors (EPIDose TM and MapCHECK TM ) and TPS calculated ones for every split field. All EPID images were acquired with an aSi-500 imaging device mounted on a linear accelerator. The EPID system includes (1) image detection unit (IDU), featuring the aSi detector and accessory electronics; (2) image acquisition system 2 (IAS3) containing acquisition electronics for the IDU and interfacing hardware; and (3) a Portal Vision workstation. Within the detector, a scintillator converts the incoming X-rays into visible photons. The phosphor scintillator converts incident radiation into optical photons, enhancing the sensitivity of the detector more than tenfold. , The light is sensed by a photodiode array attached to the amorphous silicon panel. The photodiodes integrate the incoming light into charge captures, and the detector electronics transfer the charges from pixels to read-out electronics. The sensitive area of the panel is 512 Χ 384 pixels, with a pixel size of 0.784 mm and a total sensitive area of 40 Χ 30 cm 2 . The intrinsic water equivalent thickness is 8 mm as per manufacturer specification. In the present work, we acquired all images in the "integrated mode". EPID is calibrated by the acquisition of dark field (DF) and flood field (FF) images as per the vendor instructions. The DF image (formed by 100 frames) is acquired with no radiation and records the pixel offsets. The FF image (formed by 200 frames) is recorded with an open field uniform irradiation covering EPID area to determine the differences in individual pixel sensitivities. The defective pixels showing very cold or hot signals are automatically removed from the EPID by applying a pre-determined defect map obtained by the portal vision software through a drift image. The basic characteristics of aSi EPID dosimetric performance were extensively analyzed in the initial phase of our study and the results are comparable with the published papers. All the measurements have been performed at a source to detector distance of 105 cm and gantry at 0°. Before acquiring EPID image of every field, a dark field image was acquired. The two-dimensional dose measuring device used in this study is the MapCHECK™ Model 1175 (Sun Nuclear). The system consists of 445 n-type diodes that are in a 22 Χ 22 cm 2 2-D array with variable spacing between diodes. The matrix represents two detector densities; those in the central detection area (10 Χ 10 cm 2 ) contains 221 diodes spaced 10 mm and each line of detectors is shifted 5 mm with respect to the next, in such manner the diagonal spacing between detectors is 7.07 mm; in the outer part there are 221 diodes spaced 20 mm and each line is shifted 10 mm. In this way, the resulting diagonal spacing is 14.14 mm. Each detector has an active area of 0.8 Χ 0.8 mm 2 . The proprietary design of these n-type diodes makes them resistant to damage by radiation. Two acrylic plates that have conductive surfaces envelop the diodes, which are mounted on a multilayered circuit board. This provides shielding from radio frequency fields generated in a linear accelerator. The inherent buildup of the instrument is 2 g/cm 2 , while the linear depth from the top of the detection plane is 1.35 cm and the inherent backscatter thickness is 2.27 g/cm 2 . 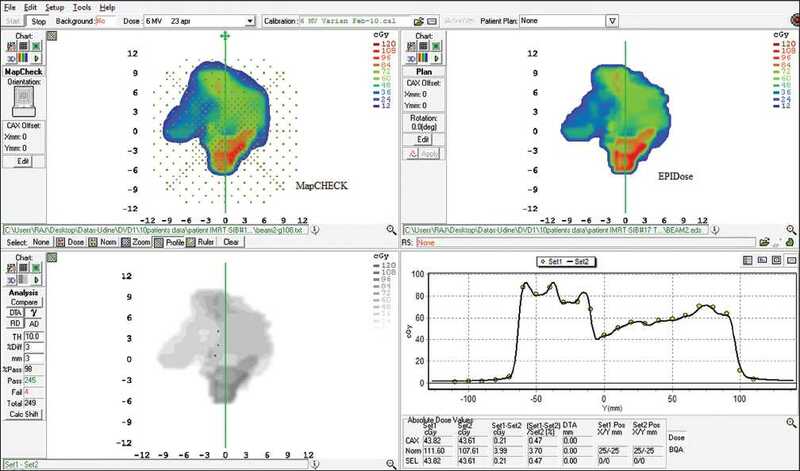 EPIDose TM is a commercial software application (Sun Nuclear, Melbourne, FL,USA), which allows to convert the image acquired by an EPID in a dose map and to compare the dose map with a reference dose distribution. For the purpose of implementation of EPIDose TM , a set of integrated images of open fields of different intensities and sizes are acquired and consequently imported into EPIDose TM together with the output factor table measured by MapCHECK TM to establish basic algorithm configuration data. The processes carried out by the EPIDose TM algorithm are specified in four steps. In the first step, a simple geometric back-projection technique is applied to the raw EPID image to scale its pixels to the desired dose plane distance. Second, corrections for output factors and the source distribution of scattered photons are applied to each MLC sub-fields. In the third step, the results are convolved with a dose redistribution kernel to simulate wider electron spread in water. In the final step, the relative dose maps are then converted to dose using calibration array data in the EPIDose TM model based on MapCHECK TM absolute dose planes. As a first part of clinical commissioning of EPIDose TM , we have validated its performance by comparing the measurements of simple fields as square, rectangular fields and off-axis fields with MapCHECK TM . we adopted the following γ-criteria: 2 mm and 2%. Recently, in our institution we have started step and shoot IMRT (S & S IMRT) treatments for WP-SIB to prostate (25 fractions) using the optimization module (Direct Step and Shoot) of Masterplan TPS (Nucletron, Veenendaal, The Netherlands). The algorithm of dose was enhanced pencil beam. The prescribed doses were 67.5 Gy, 56.5 Gy, and 50 Gy delivered to prostatic gland, seminal vesicles, and pelvic lymph nodes, respectively. Our routine pre-treatment patient specific QA includes 2D planar doses verification and absolute point dose. For the first type of QA, we employ MapCHECK TM matrix measuring the dose distribution of each split field. The comparison between calculated and measured dose is made by means of the gamma function analysis,  adopting a DD criterion of 3% and a DTA criterion of 3 mm. For the calculation of γ-index , we use the analysis tool of Mapcheck TM software. The γ-index is calculated in local dose. We exclude from the analysis the points having a dose value lower than the 10% of the maximum dose. A plan is accepted if the percentage of points with gamma below 1 is higher than 90%. The point dose measurements were carried out using a calibrated 0.6 cm 3 Farmer-type ionization chamber (NE2571, Nuclear Enterprises, Fairfield, NJ) to assess the dose in a clinically meaningful high-dose gradient region, delivering all beams at original gantry angle. As a phantom, we employed a polymethyl methacrylate (PMMA) slab phantom. The acceptance criterion for point dose measurement is a maximum deviation of 3% between calculated and measured value. For the clinical commissioning of EPIDose TM , we have considered a total number of 104 split fields of 10 different WP-IMRT plans using both EPIDose TM and MapCHECK TM . The treatment configurations were as follows: one including 5 beams (n = 9 patients with 10 splitted fields per patient) and the second one consisting in 7 beams (n = 1 patient with 14 splitted fields). We obtained an improvement of the spatial resolution of the diode matrix device by irradiating it in different position of the same field and merging the resultant dose images. γ∆ value, defined as the previous mean γ value + 1.5 SD. Percentage of points with γ < 1, g < 1.5, and γ > 2. 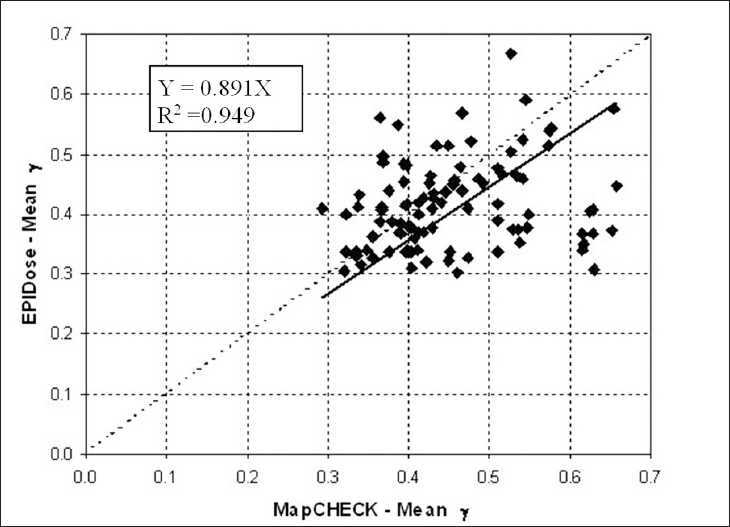 The g values were calculated by the analyzing software of MapCHECK TM . [Figure 1] shows a sample of comparison of measured dose maps using EPIDose TM with TPS calculated doses. The comparison of profiles along the Y-axis is shown in lower right window. A similar example of comparison between the MapCHECK TM measured and TPS calculated doses is shown in [Figure 2]. The comparison between MapCHECK TM and EPIDose TM for a merged field (i.e., merging 2 split fields) is shown in [Figure 3]. The measured fields using EPIDose TM in terms of percentage of points with γ ≤ 1 resulted in well agreement with MapCHECK TM measured fields. The values of the g frequency parameters (namely, mean γ, γ∆ , and the percentage of points with γ < 1, γ < 1.5, and γ > 2) obtained from the cumulative histogram statistical analysis for the WP-IMRT 104 fields corresponding to ten different patients are summarized in [Table 1] both for EPIDose TM and MapCHECK TM measurements. The mean γ values are determined to be 0.42 (SD: 0.06) and 0.44 (SD: 0.06) for EPIDose TM and MapCHECK TM , respectively. The average g for EPIDose TM and MapCHECK TM are determined to be 0.51 (SD: 0.06) and 0.53 (SD: 0.07), respectively. 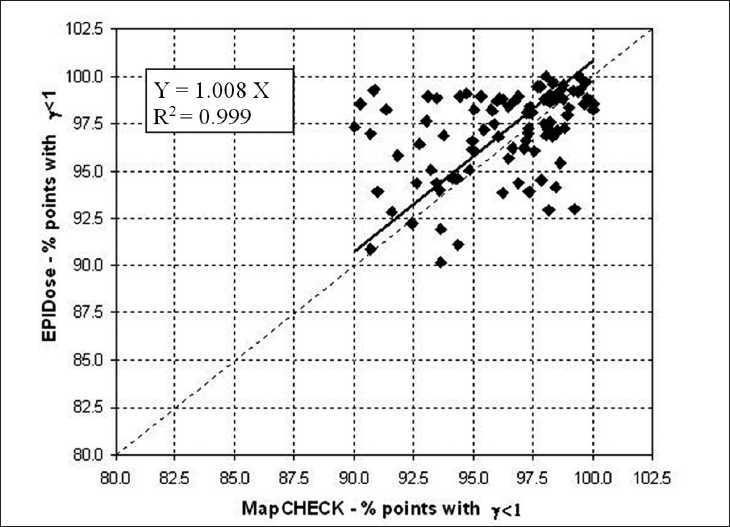 Furthermore, the percentage of points with γ < 1, γ < 1.5, and γ > 2 are 97.4%, 99.3%, and 0.56%, respectively for EPIDose TM and 96.4%, 99.0%, and 0.62% for MapCHECK TM . We have quantified the agreement between the two dosimetric verification methods by determining the correlation of the two set of results. For statistical analysis, we applied the linear regression test by Pearson (SYSTAT 10, Systat Software, Inc., Chicago, IL, USA). [Figure 4], [Figure 5], and [Figure 6] show the statistical analysis between the overall values obtained from the measurements of two detector systems in terms of mean γ, percentage of points with γ < 1 and γ < 1.5, respectively. The correlation coefficient were 0.949, 0.999, and 1.000, respectively for the repopulation of mean γ, percentage of points with γ < 1 and γ < 1.5. We evaluated the dosimetric performance of EPIDose TM by comparing it with MapCHECK TM ; MapCHECK TM being our standard tool for patient-specific QA in IMRT. The comparison was made in terms of the agreement parameters mean g, mean g∆ , percentage of points with γ < 1, γ < 1.5, and γ > 2. The mean γ, mean γ∆ values, the percentage of points with γ < 1, γ < 1.5, and γ > 2 values for EPIDose TM were in good agreement with MapCHECK TM estimated values. 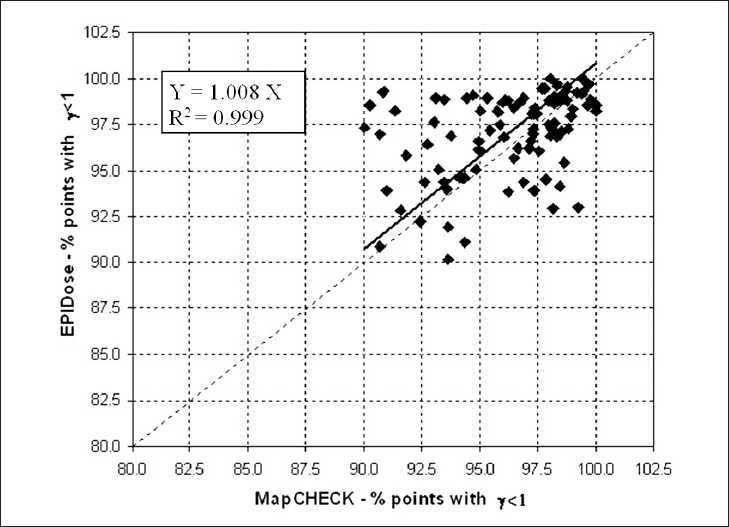 The correlation graphs of the [Figure 4], [Figure 5], and [Figure 6] show a slight trend towards better results with EPIDose TM than MapCHECK TM dosimetry, i.e., lower mean g values, higher percentage of points with γ < 1 and similar trend for percentage of points with γ < 1.5. In general, the obtained results with both EPIDose TM and MapCHECK TM are comparable. The slightly better values of the g parameters obtained using EPIDose TM could be due to its finer spatial resolution. Therefore, based on our results obtained with EPIDose TM and strong agreement with MapCHECK TM , we may conclude that the EPIDose TM portal dosimetry system has been successfully implemented and validated with our routine 2D array detector for Step-and-Shoot IMRT of prostate cases. Furthermore, portal dosimetry using EPIDose TM is an efficient and fast method for a routine verification of intensity modulated fields. One of the authors (C.Varatharaj) undertook this work with the support of the "ICTP -IAEA Sandwich Training Educational Programme", Trieste, Italy". 1. Letourneau D, Gulham M, Yan D, Oldham M, Wong JW. Evaluation of 2D diode array for IMRT quality assurance. Radiother Oncol 2004;70:199-206. 6. Poppe B, Djouguela A, Blechschmit A, Willborn K, Ruhmann A, Harder D. Spatial resolution of 2D ionization chamber arrays for IMRT dose verification: Single-detector size and sampling step width. Phys Med Biol 2007;52:2921-36. 8. Zhu Y, Jiang XQ, Vandyk J. Portal dosimetry using a liquid ion chamber matrix: Dose response studies. Med Phys 1995;22:1101-6. 9. Mijnheer none B. State of the art of in-vivo dosimetry. Radiat Prot Dosimetry 2008;131:117-22. 10. Heijmen BJ, Pasma KL, Kroonwijk M. Portal dose measurement in radiotherapy using an electronic portal imaging device (EPID). Phys Med Biol 1995;40:1943-55. 11. Pasma KL, Dirkx ML, Kroonwijk M, Viser AG, Heijman BJ. Dosimetric verification of intensity modulated beams produced with dynamic multileaf collimation using an electronic portal imaging device. Med Phys 1999;26:2373-8. 12. Bolle Boellaard R, Van Herk M, Uiterwaal H, Mijnheer BJ. Two-dimensional exit dosimetry using a liquid-filled electronic portal imaging device and a convolution model. Radiother Oncol 1997;44:149-59. 13. Van Esch A, Vanstraelen B, Verstraete J, Kutcher GJ, Huyskens DP. Pre-treatment dosimetric verification by means of a liquid-filled electronic portal imaging device during dynamic delivery of intensity modulated treatment fields. Radiother Oncol 2001;60:181-90. 14. McCurdy BMC, Luchka K and Pistorius S. Dosimetric investigation and portal dose image prediction using an amorphous silicon electronic portal imaging device. Med. Phys. 2001;28: 911-924. 20. Portalvision: A Si500 reference manual. Palo Alto, California: Varian Medical Systems; 2006. 21. EPIDose TM User Manual. Melbourne, Florida: Sun Nuclear Corporation; 2008. 23. De Martin E, Fiorino C, Brogli S, Longobardi B, Pierelli A, Perna L. Agreement criteria between expected and measured field fluences in IMRT of head and neck cancer: The importance and use of the g histograms statistical analysis. Radiother Oncol 2007;85:399-406. 25. Childress NL, Allen White R, Bloch C, Salehpour M, Dong L, Rosen II. Retrospective analysis of 2D patient-specific IMRT verifications. Med Phys 2005;32:838-50.